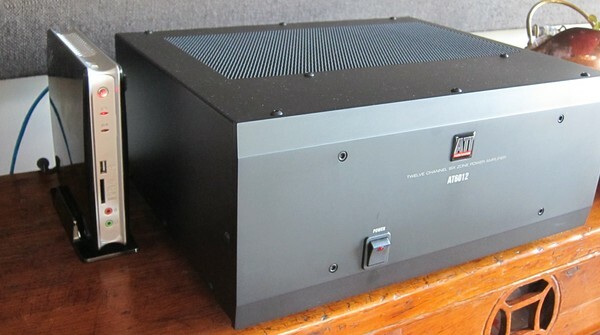 The analogue circuitry and ASP printed circuit board for equalizing woofer and midrange drivers, for crossovers from midrange to woofer and tweeter and for equalizing the overall response performs well, but uses through-hole technology for mounting components. This is a dying technology and has been replaced by surface mounted devices. Consequently, procurement of high quality leaded capacitors can be a problem and is not going to improve in the future. The sensible solution is to replace the LX521 ASP with a digital processor of equal or enhanced performance. I challenge whoever has the skill set and experience with DSP design to come up with a prototype that meets the minimum set of requirements below. Send the prototype to me after you have verified to your satisfaction that it meets those requirements. Let me evaluate the prototype, your cost analysis and feasibility for DIY construction and then return it. Let's talk about how to distribute your design or product so that LX521 customers and us can benefit from it. 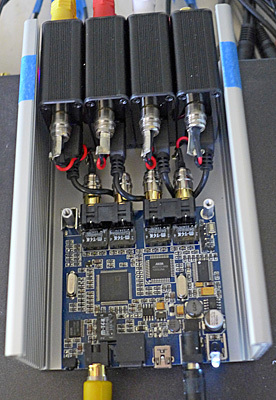 For a second product development the DSP unit could be combined in one enclosure with 10 Hypex power amplifiers and their power supply. Volume control must be included. Four speaker cable bundles would be connected to two 4-conductor and two 8-conductor Neutrik Speakon connectors at each end. Richard's Stuff - An exemplary DSP design. Signal level, noise and distortion issues have been investigated and addressed. Our longtime contributor and highly respected supporter of the OPLUG, known as 'Davey', sent me a DSP prototype to which I have listened now for many hours. I am quite impressed. Its performance is on par with the LX521 ASP. It is an alternative to the ASP. 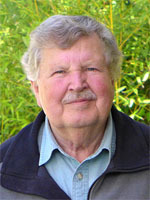 The only drawbacks that I see are the lack of analog input capability, which could be resolved by adding a suitable ADC module, and secondly, an input-to-output gain of less than 0 dB, which can make it impossible on some program material to drive the loudspeakers to full volume without a separate preamplifier. Construction of the DSP is literally plug-and-play due to RCA coax interconnects between modules. No soldering is required. But the DSP needs to be configured via USB from a computer. After that operation the DSP is self contained and runs independent of a computer. The proprietary LX521.xml file, which is essential to obtain the intended DSP functionality, is available for owners of LX521 Construction Plans. For analog input I used an ADC with S/PDIF & Toslink outputs, a SESCOM DCT-4T. It is inexpensive. It runs at 48 kHz rate, which is up-sampled to 96 kHz inside the nanoDIGI. 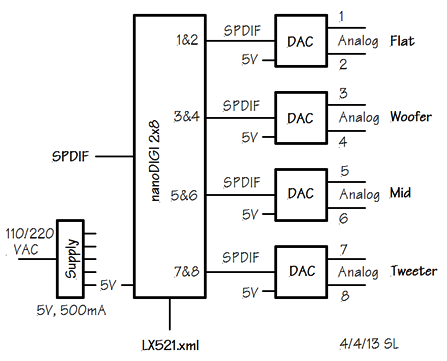 When used for lower grade analog sources the ADC may have insignificant audible consequences. Output from high quality sources is most likely in digital format. I reconfigured my sound system, placing the MCV channel gain and volume control downstream from the DSP, which therefore operates with maximum digital signal levels. This is desirable for maximum signal-to-noise ratio, but runs the risk of signal clipping, particularly in the woofer channel with its large amount of boost for very low frequencies. I did not notice any problems so far. I added 3 dB of analog gain to the woofer output channels using the MCV. The ADC outputs are dead-quiet. The Squeezebox Touch has volume control for the SPDIF digital output, but not the Oppo BDP-95. Before you build this DSP solution you need to establish how you are going to control volume in your setup. The nanoDIGI 2x8 itself has IR remote volume control capability, but only by decreasing gain. What I find attractive about this prototype is the simplicity with which it can be built. The nanoDIGI 2x8 is the core, having convenient digital input and output connections to which a variety of DAC's and ADC's can be connected, depending on the user's preferences and needs, once the core has been configured with the LX521 specific firmware. The proto is a low cost solution as shown, but there is no limitation to using different peripherals with the core processor, if needed. But in that case the solution could become expensive and a different hardware implementation might be preferable in order to accommodate analog input signals. AES/EBU data streams can probably be handled with a simple passive interface or directly. A drawback of the above solution for my use is the marginal output level from the DAC's, which I compensate by using the MSB multi-channel volume control with up to 10 dB of gain. I also increase the woofer channel gain in the MSB. After more listening by myself and an experienced audio professional I can state that Davey's LX521 DSP prototype is without reservations an excellent alternative to the ASP in a stereo system application. 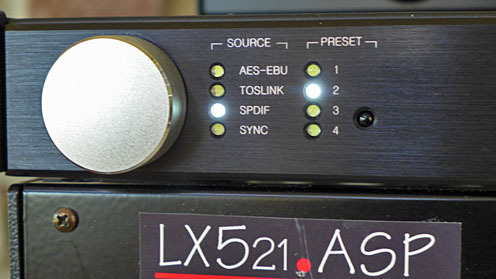 But, if a number of LX521 are to be used in a surround setup, then a DSP with analog inputs or the ASP are required, because multichannel digital data streams, such as in HDMI interfaces, are not available with multiple 2-channel S/PDIF connections. I am fully confident that Richard's meticulous design will match the LX521 ASP in performance. Solution a) is missing analog inputs and AES-EBU digital inputs. For a complete solution Tony@ miniDSP suggested to try out the miniDSP 4x10 Hd . It is a self-contained unit and with analog output for 8-channels already built-in. Davey adapted his configuration file from the nanoDIGI 2x8 to this fully assembled, yet highly flexible digital signal processing platform. I have been listening to this processor now for a while using analog and digital outputs from the Oppo BDP-95 and Squeezebox Touch. I still use the multi-channel volume control after the miniDSP 4x10 Hd to be able to get extreme volume levels from the LX521 and AT1806 power amps. Davey has preset the unbalanced outputs to limit at 1.3 Vrms. On several occasions I amplified them by 5 dB in the MCV. But the unit can be switched to 2.5 Vrms max output. I will use that in the future and in conjunction with the internal volume control. It should eliminate any need for the MCV. I am pleased with what I have heard so far. The miniDSP 4x10 Hd strikes me as more than an alternative to the ASP, accommodating both analog and digital sources and also providing volume control. The configuration file is available for owners of LX521 Construction Plans. Contribute from your knowledge and experience to "The DSP Challenge" discussion on the OPLUG.